Tillandsia, or Air plants are natives of rain forests, desserts and swamps. Air plants do not require soil. They absorb water and nutrients though the leaves. They use their roots only for attachment to surfaces that offer good sun exposure. 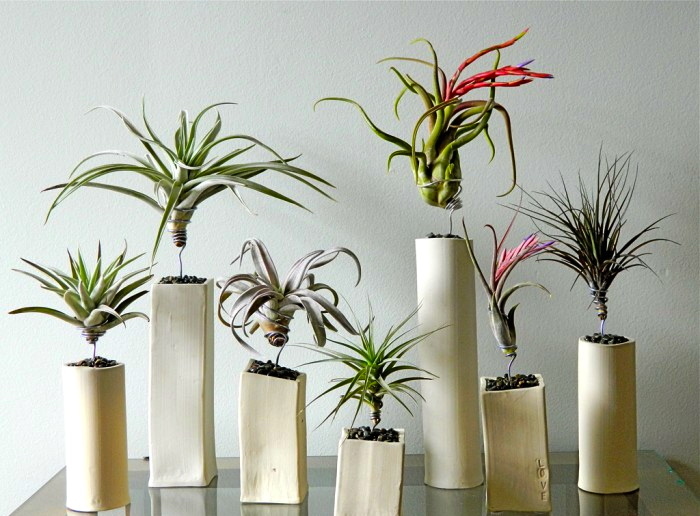 Air plants can be glued to wood, displayed on trays and in bowls. Use a non-toxic waterproof glue such as Tilly tacker to glue the plants. They need bright and indirect light. East facing windows are recommended. West facing windows will work as well, as long as the light is indirect. Air plants need to be watered regularly. They also need to be fertilized, now and then. They also flower, occasionally, and send offshoots called "pups". There are various types of air plants available in garden centers, with varying textures. While displaying, you can add rocks to the tray or the bowl containing the air plants.